We've talked a lot on our blog about how global companies can bring their employees together by creating virtual workplaces for meeting, training, and collaborating. I believe it's a crucial way companies can and should go green, conserve energy, and protect our environment. But employees don't have to be dispersed around the world in order to contribute to a greener planet. Measurable energy and cost savings can be realized by having local employees meet virtually, too. Aflac is one example. 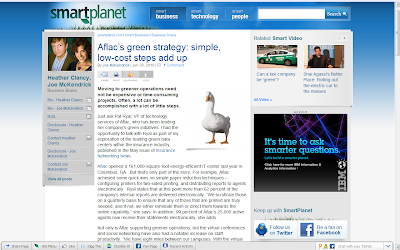 Joe McKendrick recently featured Aflac's green strategy in an article on Smartplanet.com. Eight miles separate the company's campuses in Columbus, Ga., and employees often meet virtually, rather than driving to and from the locations. I think Aflac has the right idea about how to support green operations, which I wrote more about in the comments under Joe's story. I'd be interested to know more about Aflac's virtual meeting approach, and seeing what its next steps are in its overall eco-friendly initiative. Global enterprises like Aflac have the opportunity to be a model for other companies, and set the pace to empower a green, virtual, high-performance workplace for us all.